Starting in 1999, One Piece is one of the longest-running anime series in existence. Given that there are now over 800 episodes and counting, it’s understandable why any newcomer wishing to jump into the show would feel intimidated. While all the One Piece episodes are available for free viewing in some parts of the world, other regions are not so fortunate. Pirates have used the show’s unavailability in these areas as an opportunity, hawking fake DVDs to those interested in giving the series a go. Sadly, this does more bad than good; piracy is harmful to the anime industry, and fake DVDs are often of such horrible quality that they ruin the viewing experience. 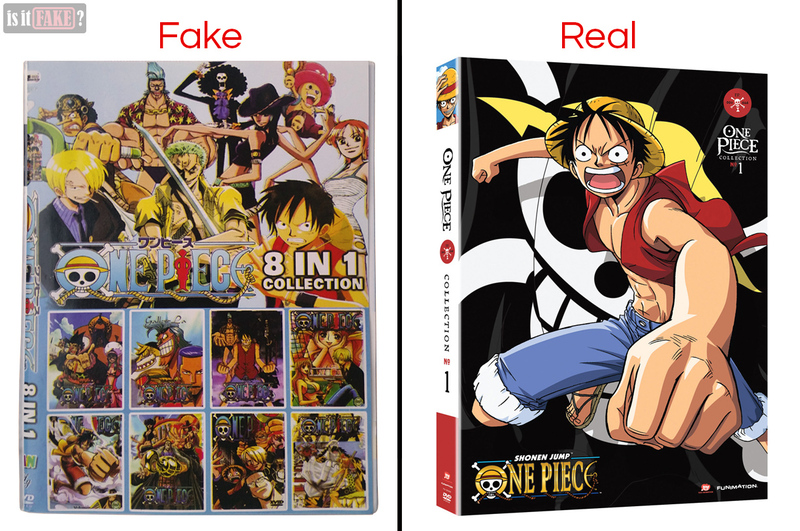 In this article, we’re therefore going to review a fake One Piece DVD to demonstrate why buying such an item is always a bad idea, as well as recommend various ways to watch the series legally. You’ll know an establishment selling fake DVDs when you see one. Found in some malls, markets, or even on the streetside, they’re usually cramped stalls or stores, where piles upon piles of cheaply packaged DVDs are on exhibit. 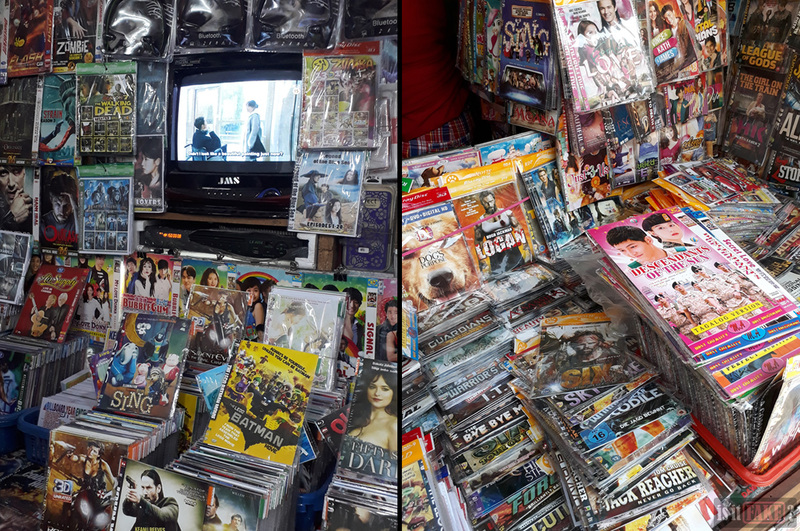 Such stores sell fakes from various illegal “brands.” In the Philippines, today’s most prolific DVD pirates are KuroNeko and M.A. However, we also spotted another going by the name of Abdul Jabbar Production. Abdul Jabbar Production is a nonentity on the internet; you won’t find any social media accounts or official websites named such. This isn’t surprising; pirates aren’t too keen on publicly announcing any information that could get them shut down. True, the lack of an online presence doesn’t necessarily mean a company is operating illegally. But pair this with a terrible product, and you can be sure something isn’t right. The DVD cover is paper folded in the middle to form the cover’s back and front sides. Both sides feature an overabundance of official One Piece art, so much so that the overall design looks like a mess of colors and characters. The print quality is hideous. Not only is there blurring, there also seems to be too much yellow, so everything has a sallow tint. The colors also seem to be misaligned, creating a “double vision” effect. The back cover presents a surplus of data presumably about the DVD. However, all it takes is mild scrutiny to figure out that most of this information is bogus. In fact, many of the claims contradict each other. 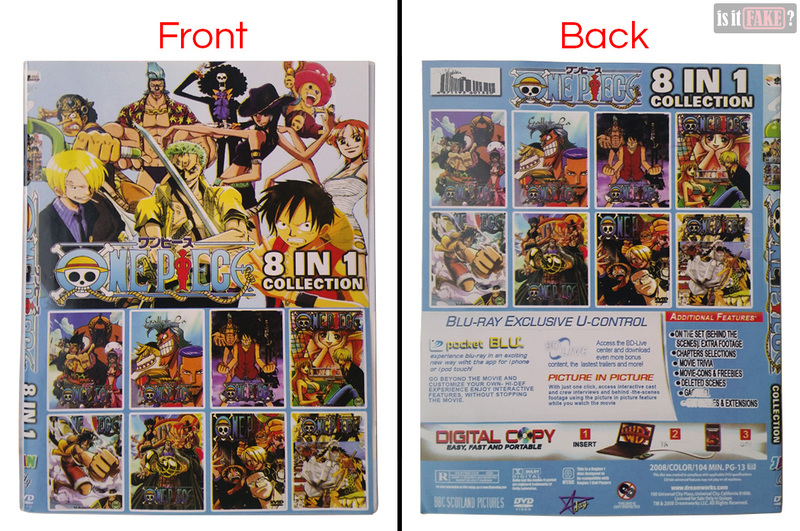 The graphic on the front cover clearly states that the DVD is an “8 in 1 collection”. It isn’t made clear what this “8” refers to, however. It could mean 8 episodes, of course; unfortunately, it doesn’t even specify which season those episodes fall under. 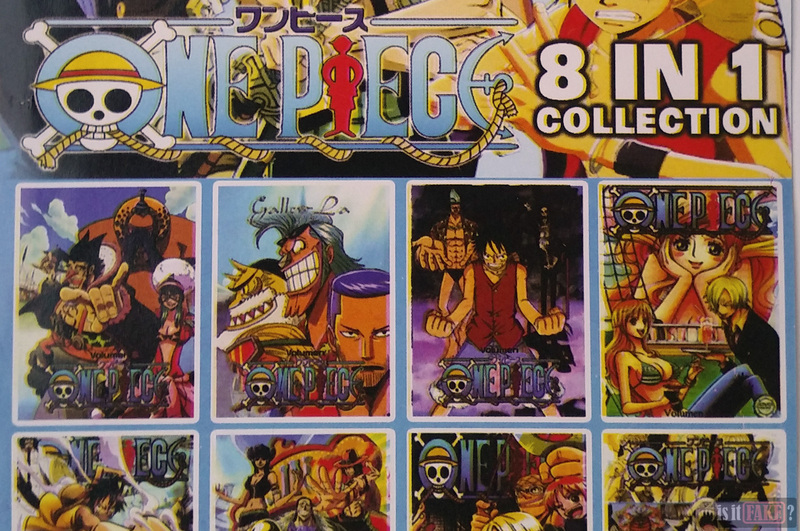 Like us, most will likely assume the graphic means “8 videos,” which in turn could mean 8 One Piece movies. For example, at the very bottom we see the Warner Bros. Entertainment logo, the BBC Scotland Pictures label, and the DreamWorks Animation link. None of these companies have ever had anything to do with One Piece. 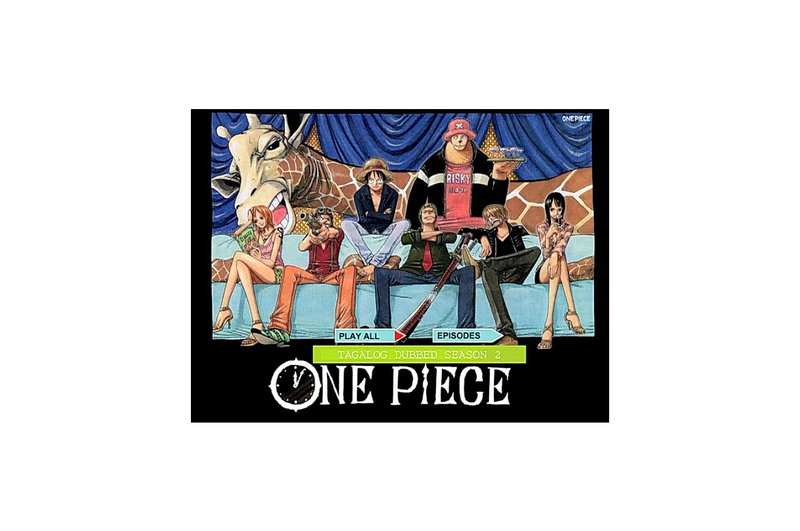 These companies have also never collaborated to produce and/or distribute One Piece DVDs outside Japan; the licensing company responsible for bringing One Piece to North America and the UK are FUNimation and Manga Entertainment respectively. In the bottom left corner, we see the Rated R age restriction, but in the opposite corner, we see PG-13. For One Piece, an anime with young people as its primary audience, to have two contrasting age restrictions – one of them an R, at that – does not make any sense. Also at the bottom, we see the DVD Video logo. But in the white rectangular space above it, the text suggests the product is a Blu-Ray disc. Again, this is an absurd contradiction. Whoever designed the back cover simply took a bunch of random big-name company logos and labels and slapped them together in the hopes of making the fake product look official. The end result, however, destroys any possibility of it even remotely resembling a real, licensed item. 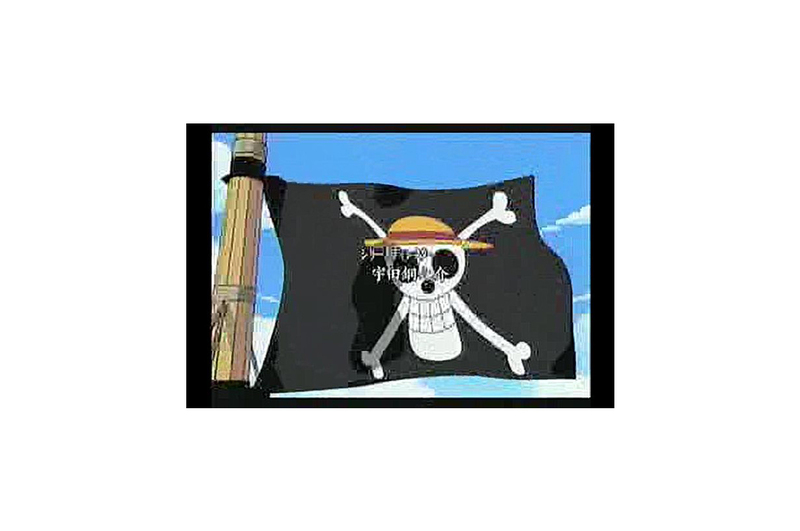 Any research on the barcode doesn’t yield any information related to One Piece. Lastly, the back cover also claims the DVD comes with a number of additional features. The only way to test this, of course, is to run the disc in a DVD player. The DVD disc itself is wrapped in a diaphanous white cloth. A small portion of the same chaotic art used on the front cover is printed on top of the disc. Our DVD player had no trouble reading the disc. We were, however, unprepared for what came next. 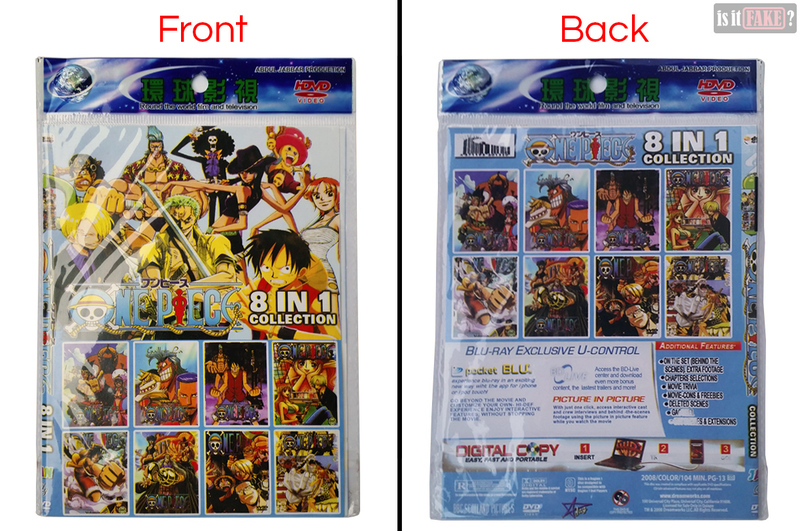 The fake DVD has a menu screen which states the disc contains One Piece season 2 episodes dubbed in one of the major Philippine languages, Tagalog. This information would have been extremely useful on the front cover. The menu screen lets you play all the episodes, or visit episode selection. Episode selection is composed of several pages, with each page having 9 episodes. All in all, the DVD has a total of 45 episodes. The video quality of each episode is atrocious, with a resolution of 655 x 436. This is a far cry from the high definition TV we’ve gotten used to the last decade. The picture is pixelated and grainy, making it hard to look at. Enlarge it to full screen, and it gets even worse. The logo of major Philippine media company GMA Network can even be found on the upper right corner of the screen, making it obvious from which TV studio the episodes were ripped. The sound quality is just as abhorrent, making the videos as difficult to listen to as they are to watch. Even worse, the videos don’t give you any language options other than Tagalog. And because there are no subtitles in English or any other language, anyone who doesn’t understand Tagalog will find no value in these episodes. 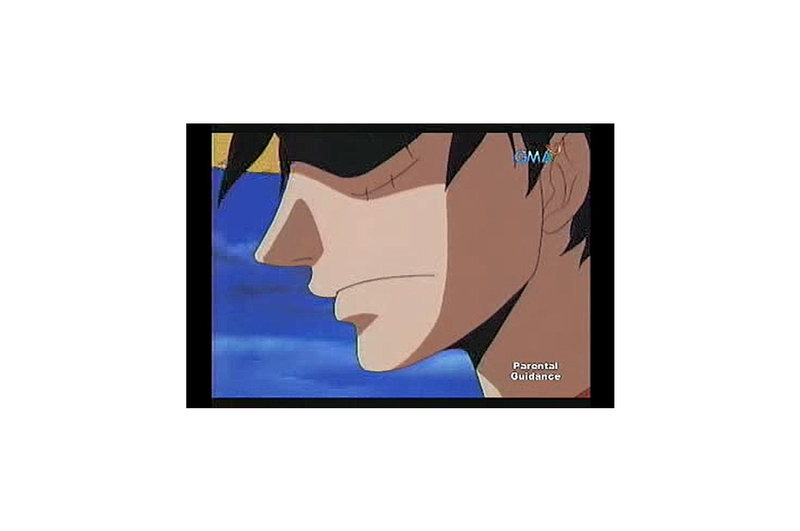 GMA’s Tagalog dub of One Piece was created fundamentally for the Filipino crowd and no one else. If you’re a non-Filipino and you purchased this fake DVD, you’ll be in for a world of disappointment. As for all those features advertised on the back cover? The extra footage, movie trivia, deleted scenes, etc.? They’re nowhere to be found. Depending on where on the planet you live, you can either watch One Piece entirely for free, or purchase One Piece DVDs usually priced between $19 and $53. If you live in North America, you’re in luck. All the episodes of all seasons of the One Piece anime are available for free viewing on VIZ Media’s website. If you live elsewhere, however, you’ll have to purchase the DVDs. FUNimation produces One Piece DVDs which give you the option to switch between English and Japanese languages and subtitles. While FUNimation’s One Piece store isn’t available in all regions, their One Piece DVDs are available on Amazon – just make sure you buy from Amazon itself and not a third-party seller. You can also buy One Piece movies from Google Play. Another option is to visit the official Japanese One Piece site, which has a large selection of DVDs and other merchandise on display. 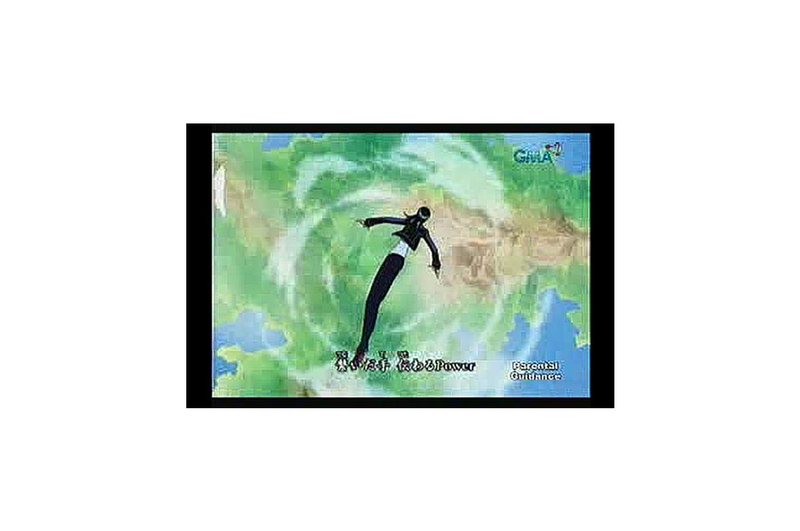 Clicking on an item will open a window containing the links to several online stores, such as Rakuten and Amazon Japan, where you can buy official One Piece DVDs. 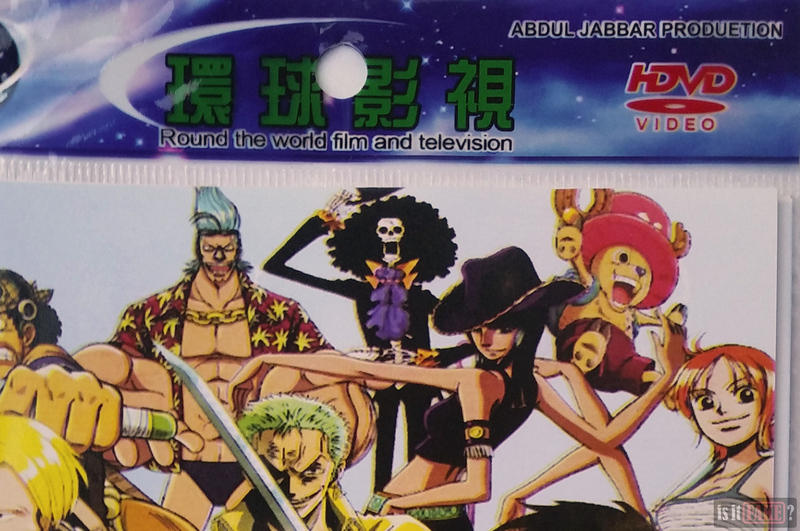 Its ghastly cover rife with nonsensical and deceptive information, dreadful video and sound quality, and absence of features advertised on the back earn this fake One Piece DVD a 99% terrible rating.